Today’s guest blogger is Lizzie Bramlett, a.k.a. Fuzzy Lizzie, a self-made clothing historian who has a website, Fuzzy Lizzie, and a blog, The Vintage Traveler. 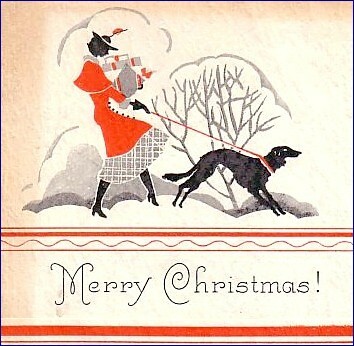 As a fan of vintage clothing and all things vintage related to Christmas, I naturally seek out vintage Christmas cards that have a fashionable edge. 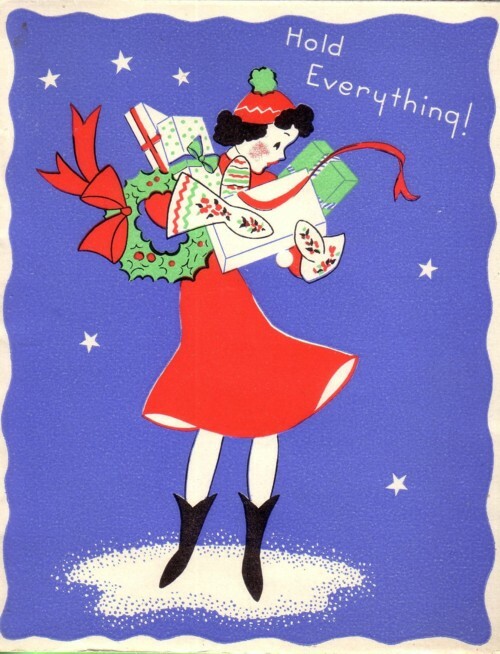 The clothing shown in these vintage card illustrations is often stylized and a bit romanticized, but looking at them, you can still get a good idea of the fashion trends of the day. 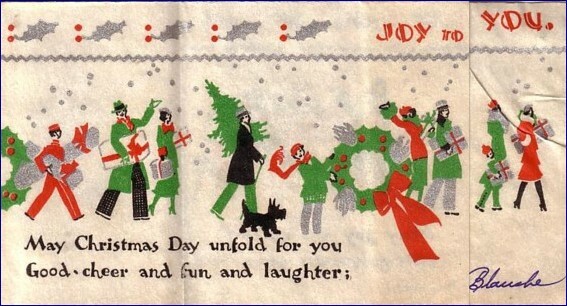 All of the cards shown here are from the Great Depression of the 1930s. 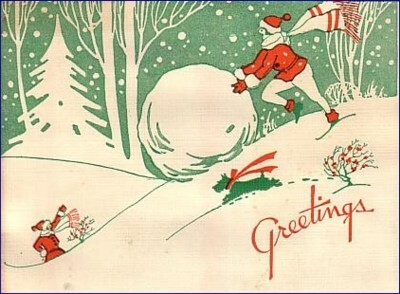 Even though many people were either making their clothing from cheap fabrics like feedsack or just plain doing without, the clothes depicted in vintage cards from this era were often extravagant, with fur trimming on coats and suits. Gloves were not illustrated to show their functionality but were treated as huge decorated gauntlets. And hats were not just for warmth; they were high fashion fantasies. 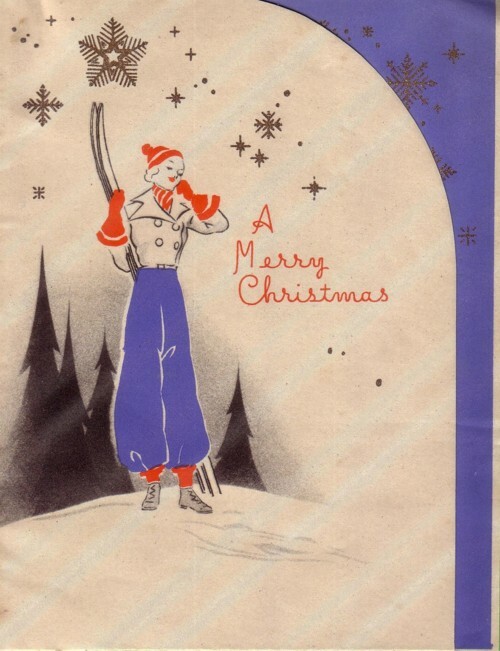 As much as I love the cards showing shoppers, cards showing women skiers and skaters are my favorites. 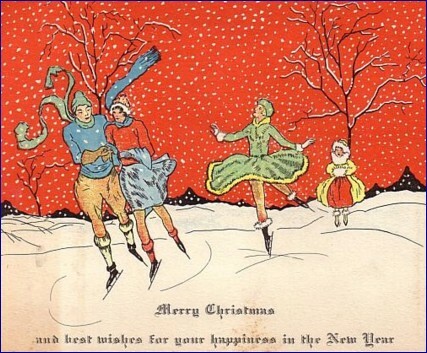 At a time when women rarely had the money for specialized clothing, fur-trimmed skating skirts and coordinated skiing sets were items most women could only have in their dreams. But it was hopes and dreams that kept people going in these tough times, so the cards were like little promises of better times ahead. No wonder these little snippets of fashion and cultural history still excite collectors today! Check out more cards below. 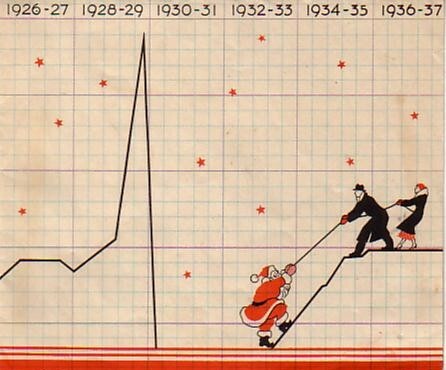 And Merry Christmas from your friends at Collectors Weekly! Wonderful! Charming! I love your blog and always learn something new and interesting when I visit. Thank you for sharing your passions. “ ” The Soviet Union failed to live up to its promises of an egalitarian, industrial society, quickly devolving into a brutal, violent dictatorship.